William Byrd’s Gradualia is one of the most unusual and elaborate musical works of the English Renaissance. This large collection of liturgical music, 109 pieces in all, was written for clandestine use by English Catholics at a time when they were forbidden to practice their religion in public. 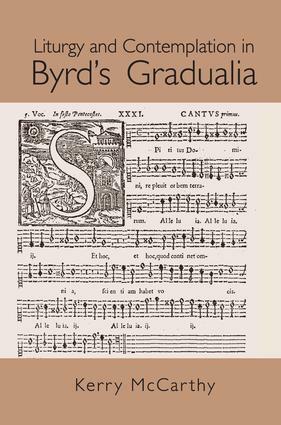 When Byrd began to compose the Gradualia, he turned from the penitential and polemical extravagances of his earlier Latin motets to the narrow, carefully ordered world of the Counter-Reformation liturgy. It was in this new context, cut off from his familiar practice of choosing colorful texts and setting them at length, that he first wrote about the "hidden and mysterious power" of sacred words to evoke a creative response. Liturgy and Contemplation in Byrd’s Gradualia responds to Byrd’s own testimony by exploring how he read the texts of the Mass and the events of the church calendar. Kerry McCarthy examines early modern English Catholic attitudes toward liturgical practice, meditation, and what the composer himself called "thinking over divine things." She draws on a wide range of contemporary sources — devotional treatises, commentaries on the Mass, poetry, memoirs, letters, and Byrd’s dedicatory prefaces — and revisits the Gradualia in light of this evidence. The book offers a case study of how one artist reimagined the creative process in the final decades of his life.